Dogs with canine cognitive dysfunction can still have enriching lives! The trick is to choose activities that do not include difficult problem solving or complex motor skills. For example, some food toys, especially those designed for puppies, are perfect. There is evidence that enrichment can help delay the progress of dog dementia. My dogs have tested and enjoyed all of the following enrichment toys. They are all simple toys based on the premise that most dogs will naturally sniff and nudge something that smells like food. The toys are designed to let the food fall out very easily. None of them requires that you buy a special kind of food. But even enrichment toys this simple can have a learning curve. You can help your dog be successful with toys. Check out my movies: Old Dogs Can Learn to Enjoy Food Toys and Kongs for Beginners, (also embedded at the bottom of this page). They demo how to teach dogs to play with food toys. The Twist N Treat can be adjusted to be super-easy to get food out of. Kibble or small cut up treats work well with this toy. The Barnacle will eject food from inside, and also the bone designs on the outside can also be filled with peanut butter or spray cheese. The Busy Buddy Chuckle makes a weird noise and also ejects treats! It can be adjusted a bit to make it easier or more difficult. Another toy that works like this: you put the food in, the dog knocks the toy around and gets the food out. The Atomic Treat Balls are tough but the rubber is pleasant to the touch. This is a very versatile toy, especially if you buy both sizes. Each on its own is easy, but you can connect them to raise the difficulty. The Tux is very flexible. You can fill the opening with kibble or other treats in small pieces. You can wedge a larger treat in there. Or you can even fill it with something moist and freeze! 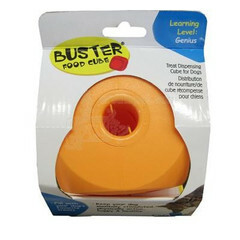 The Buster Food Cube is a little more difficult than the above toys, but if your dog has mastered a couple of those, the Buster is worth a try. Caution: it is noisy on hard floors. One of my dogs eats most of her meals out of the Pyramid. She is a power chewer but couldn’t find a way to destroy this one. The Pyramid also is best for dogs with a little food toy experience. Dog Puzzles – Challenging dog puzzles and dog games to keep your dog thinking! These principles can be applied to any type of simple hollow food toy, such as the West Paw toys above. Thank you for the great tips and illustrations. I have an assortment of treat toys that I use with a variety of dogs when they come to stay. Some dogs just have no clue. It’s great to see some good “beginner” options that increase the challenge while still allowing them to experience success. Do you have more advanced ideas as well? Sometimes I encounter very clever dogs who are done far more quickly than I’d like, especially if I was hoping for a few minutes of peace and quiet! I have a power chewer and the only thing I can use for her is the Nina Ottoson pyramid toy. It’s definitely more of a challenge than the ones on the page but still not that hard. I’ve heard good things about the IQ ball. It’s supposed to be adjustable to a fairly difficult level. I haven’t tried one yet though. One of my dogs eats all her meals out of the Tricky Treat Ball, an old favorite. It takes a long time to get those last few kibbles out. There are a couple of fairly new toys that slow dogs down efficiently, but I don’t think they are very fun for the dogs. They are called the Green Interactive Feeder and the Buster Dog Maze. I donated mine to a breed rescue of dogs prone to bloat (for slowing down eating). Hope this gives you some ideas! When I need some peace and quiet I let my dogs search for their whole dinner in the yard. We worked up to that, though. Thanks, Julie! I’m working on some more senior nosework videos myself. Thanks for the good links! I can’t get my dog to play with any toys at all. She used to love tug-of-war and fetch but she’s no longer interested. And she’s not very interested in treats. I’m kind of stumped on enrichment other than taking her for walks. I’m sorry. Ig the appetite is poor, you certainly don’t want to make eating a challenge. But sometimes some really good stuff (roast chicken or the like) can get some interest going. Can they both have a food toy in different rooms? Just some thoughts. I know that sometimes it just doesn’t work out. Hi, thanks for your information, It would be helpful, if I found you early, my beautiful Husky Silky went to the heaven last December, because of Dementia.. My heart is still broken, I miss her every day.. I other dog, small Foxy terrier dog, Choco, she’s 10 now, I can see she’s getting older, I want her keeping up active and happier, I’m trying to buy one of those toys, but all links are broken. Thanks anyway, I will visit your website again. I hope you’re still monitoring this post. It was just pointed out to me. I was wondering if you know of any food puzzle toys that are better for wetter foods. My dog is on a strict allergy diet of a kind of soft loaf, which I cut into pieces for a snuffle mat and training. It does crumble a bit but that’s unavoidable. Many puzzle toys are only suitable for kibble, which is dry of course. Sure, Debbie, there are. Look up Lickimats. Also the “Toppl” by West Paw Design. The Lickimat is good for truly wet foods (like canned food or peanut butter). I wonder if your dog’s food would work for that if you added water? I think the Topple would work for any texture. Great that you are looking into this for your dog!